Variable air pressure systems allow a machine operator to adjust tire inflation with the simple touch of a button to optimize operational efficiency between field and road based upon preset parameters. This type of system will absolutely become more and more popular in the near future, as it will ultimately provide a combination of superior traction with the lowest possible soil compaction while in field. Today, Harper Adams University has already shown a minimum yield gain of 4% comparing Michelin Ultraflex compared to standard tires. This proven yield gain could potentially be the starting point now! In fact, Michelin is one of many companies investing in variable air pressure systems through the acquisition of two leading tire inflation system companies, PTG and Teleflow. Michelin has also successfully invented and launched the EvoBib to specifically work with tire inflation systems. 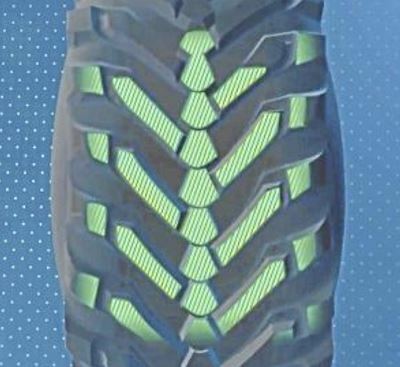 The Michelin Evobib, a ‘2 in 1 tire’ was created with a patented tread pattern and casing technology that allows it to change it’s footprint and profile more than 20% and increase traction up to 50%, according to the inflation pressure. Very soon, I imagine we will see variable air pressure systems becoming fully automated so operators won’t even have to press a button. These systems will also close the traction gap between tires and tracks, dramatically, at a significantly lower cost. This is all leading edge technology and the agricultural future is coming fast! Variable air pressure systems, or CTIS (central tire inflation systems), will almost certainly gain popularity in the U.S. market. They are already becoming common in the European market and are being offered directly from the OEMs. The reasons for their increase in popularity and inevitable acceptance span from increased fuel efficiency to reduced soil compaction, but ultimately all the benefits revolve around operating a tire at the exact correct pressure for the load and speed imposed on the tire. The challenge for Ag Tires without CTIS is that they are almost always over-inflated out of necessity and safety. The guidelines for setting pressure in an Ag Tire revolve around knowing the worst-case scenario for the tire in terms of load and speed, then using that information to determine what pressure is required to perform that job. For example, consider a MFWD tractor on duals pulling a center-fold planter. This machine will travel to the field at 25+ mph but only move at 6 to 9 mph once it gets in the field. In this example, the rear tires on the MFWD would likely need to be set at 35 psi for safety when hauling the folded planter down the road. When the rig gets into the field, the pressures could be reduced to 10 to 14 psi because the full load from the planter would no longer be imposed on the rear axle and the speed would be dramatically reduced. Reducing the inflation pressure during the planting operation would allow the tire to operate to its optimum, improving traction, increasing fuel efficiency and reducing soil compaction. But in reality, very few farmers are going to take the time to get out of the machine and reduce the air in their tires once they pull into the field. This time-consuming task would be completed automatically with a CTIS system. At Alliance, we’ve been among the leaders in the market in developing lines of all-steel IF (increased flexion), VF (very high flexion) and high-speed flotation tires. Thanks to design, engineering and construction, they all perform excellently in real-world conditions—which includes running in the field at inflation pressures that are better suited to the road. But they deliver their full benefit when they are operated at their optimal pressure for load and speed. 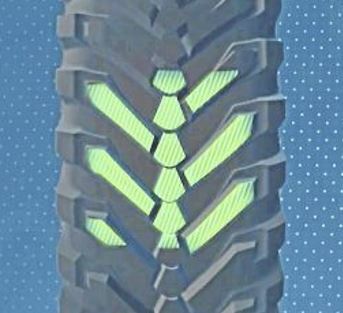 CTIS helps farmers really get the most from their tires. CTIS systems are already catching on in Europe, where awareness of the cost of soil compaction is high, and so is the percentage of the time tractors spend on the road going from field to field. So far, most American farmers have been reluctant to invest in CTIS. But US and Canadian farmers are starting to realize that in order to get maximum productivity from the horsepower they’re buying—to make sure all that horsepower is reaching the ground—they need to manage inflation pressure. And a CTIS package is a small fraction of the cost of a modern tractor, so I think we’re going to see a whole lot more of them. I do see variable air pressure systems becoming more common place on equipment as the prices get more affordable. They are expensive to buy and install, but should pay for themselves over the life of a high horse power tractor. Maintaining correct air pressure is so important to ensuring that all the right things happen with a tire. Most tractors that would use a variable air system would use radial tires. Radial tires require a better air management program than bias ply tires do. Various tests have shown that incorrect air pressure can waste 20%-40% engine power through slip and increased rolling resistance. Incorrect air pressures can also lead to power hop problems. Operating a tire under inflated for the weight can damage the tire construction and reduce the life of the tire. Operating at just 10% under inflation can reduce tire life by 15% or more, it increases rolling resistance and uses more fuel. This also affects the ride of the tractor and leads to increased wear on the road. Operating a tire over inflated increases soil compaction and decreases tractive efficiency. This leads to lower yields and more fuel. Again, the ride comfort and tire wear on the road will be affected. Over inflating a tire by 20% can lead to a 30% decline in performance. These can be small amounts of PSI change to maximize performance, and get the most out of tires. With this being said, variable air systems can be set to manufacturers recommendations and maintain correct air pressures according to the tractors use and implements used. These systems are being used on over the road trucks and seem to work well. IF and VF rated tires are designed to use less air pressure to carry the same weight as standard rated tires. Making sure that air pressures are correct to carry the intended load is important, since air pressures are less. By using variable air systems, this insures that the tires maintain correct air pressures without the need to continuously check air pressures. . BKT makes the Agrimax Spargo in VF sizes, and the Agrimax Force for high horsepower tractors in IF sizes. BKT also produces a line of radial implement tires in IF sizes. I do believe we will begin to see more and more onboard inflation systems showing up in the U.S. in the next 5 years. As precision farming presses on from the science of the seed, application and condition standpoint, growers are going to be looking for other opportunities to improve machine performance. Farming and tires has been a relationship of compromise. Growers understand that more compaction reduces yield. But they also understand that their time is money also. As tire technology has evolved with deflection technologies like IF and VF, it has enabled growers to run at lower inflations up to 40% lower. However, inflation pressure for transport may be different than inflation in the field. Growers will not get out of their machine to drop inflation pressures for 20 minutes to operate in the field then re-inflate for another 30 when they get back on the road. Knowing this we as the tire industry educate them to inflate the tire for the worst case scenario. This eliminates the possibility of damaging the tire due to an overloaded and underinflated condition. By doing this the grower is giving up footprint area in lighter conditions such as planting which may hinder the yield. The idea of the onboard inflation system is that it allows the grower to easily and relatively quickly adjust the inflation pressures in the tires from the comforts of the cab. This then allows them to maximize the tires footprint based on the load for each individual task hence reducing compaction and potentially increasing yields. Up to this point the reliability and cost of these types systems have turned away many. Smart phone technology along with more reliable hardware components have made the idea more acceptable. Cost however is still a hindrance for the technology. Aftermarket systems are approximately $15K, and at $3.00 corn the decision to pull the trigger on the system relies greatly on that customer’s idea of the chances of them recouping their cost in additional revenue. It is a proven fact that a properly inflated tire for the load performs better, ride, compaction, wear. With the onboard system the growers will be able to enjoy these benefits. It is just a matter if they are willing to pay for it. OE’s in N.A. are looking at introducing onboard systems. There are manufacturers that currently offer the systems on tractors but these are primarily in the European market. The additional cost for the option in N.A. will be the main hurdle until some are sold and there is shown to be a benefit, then I believe the systems both Original Equipment and Aftermarket will gain in popularity. Yes, central tire inflation pressure systems (CTIS) will become more popular on agricultural equipment in the future. When properly used, these systems can lead to improved traction in the field and reduced soil compaction which can improve crop yields. These systems allow farmers to quickly manage the inflation pressure in the tires when the axle weights on equipment changes between field and the road. This is why CTIS systems are becoming popular in Europe. Farmers in Europe use a lot of 3-point mounted equipment, and the axle loads change between the field and the road. In North America, not all tractors on a farm will need to be equipped with a CTIS system, and some farms will not need these systems at all. Today, when farmers are looking at purchasing an aftermarket CTIS system, I make the following recommendations to help them decide if these systems will or will not make financial sense. A CTIS systems makes sense for tractors when the axle weight changes between road transportation and field operation. The most common scenario in North America would be the planter tractor with a 2-point mounted, front fold planter. During road transport, the planter wings fold forward and the planter weight is carried on the rear axle of the tractor and only 4 tires on the planter. Weighing a 235 horsepower MFWD tractor with a 16/32 row front fold planter (Figure 1), the rear axle weight of the tractor is around 27,000 pounds during road transport. When the planter is unfolded in the field, the weight of the planter is now taken off the rear of the tractor and is being carried primarily by the 8 tires on the planter. Now the rear axle weight of the tractor is 16,500 pounds. With dual 480/80R50 tires on the rear of the tractor, the farmer would need to set the inflation pressure to 23 psi to carry the 27,000 pounds for road transport. When the tractor is the field, 23 psi is an overinflated condition to carry the 16,500 pounds. Having the higher inflation pressure will not damage the tire, but it does reduce the tire’s footprint. With a smaller footprint, the tire cannot fully transmit power to the ground. This reduces traction in the field and increases fuel consumption. With a CTIS system the farmer could inflate the rear tires on the tractor to 23 psi on the road, and when they get to the field the inflation pressure could be easily lowered to 12 psi. This would give the farmer the optimal footprint and all the tire to generate the maximum traction. After the field is planted, the farmer would push a button, and the rear tires would be inflated back to 23 psi for road travel. 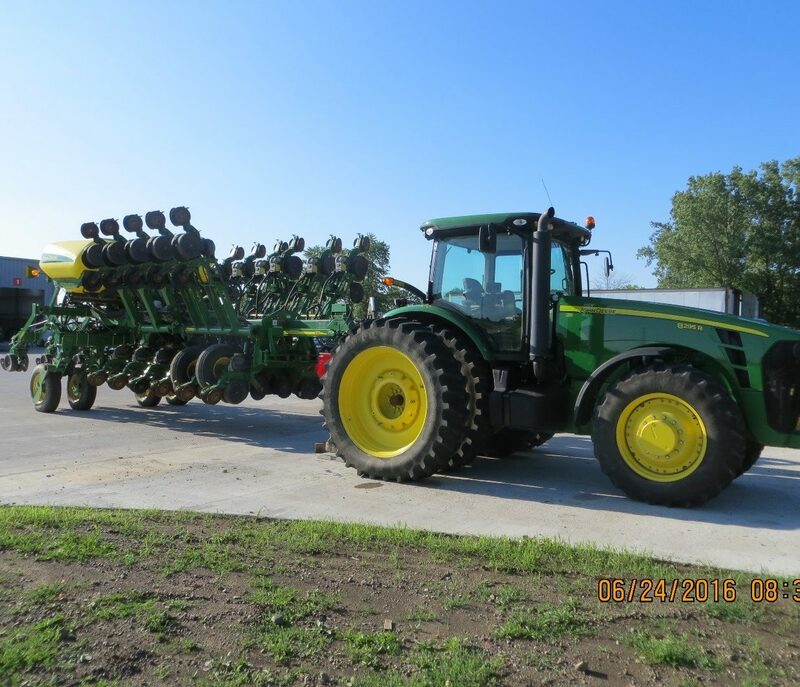 On planter tractors, I encourage farmers to explore the idea of purchasing a CTIS system. The CTIS system doesn’t make financial sense on tractors where the axle weight doesn’t change between road transport and field use, like tractors pulling drawbar tillage and planting equipment that transfers little to no tongue weight to the tractor. Using the same 235 horsepower tractor only on a field cultivator or disc, the rear axle weight of the tractor remains consistent at 16,500 pounds and the inflation pressure required is 12 psi all the time. The farmer would not benefit from a system that changes pressures between road and field. In this case, it makes more sense for the farmer to look at a tire pressure monitor system (TPMS). These systems are similar to the pressure monitor on newer cars and trucks. The TPMS display can be placed in the cab of a tractor and if the pressure is low it will notify the farmer and show which tire needs to be inflated. While CTIS systems are not an option on all new tractors, there will likely be an increase demand for these systems as options from the factory. If you feel your operation could benefit from CTIS, I encourage farmers to look at how they are using their tractors and what tire size is on the tractor. If the tractor does have different axle weights between road transport and field, there are after-market systems available in North America to add to the tractor. By matching the inflation pressure to the axle load, the tire will be developing the maximum footprint, generating the most traction and not wasting time and fuel in the field. Having the ability to use the lowest recommended inflation pressure also minimizes soil compaction, which should result in better crop yields. Because farmers are concerned about reducing soil compaction and increasing their equipment’s effectiveness, maintaining the right tire inflation pressure is a must. The good news is that tires have evolved a great deal (technologically speaking), and behave according to their construction (design), inflation pressure, applied load and working speed in an interconnected way. If setup correctly, tires will perform as expected. There’s a delicate balance between factors such as tire size, design, inflation pressure, applied load, and working speed. Many tires have evolved from a “traditional” 65 to 75 ratio (for example a 520/70R38) to a more modern 85 to 105 ratio (for example a 520/85R38). These new ratios enable the tire to hold more air and increase the load capacity. This increased load capacity should reduce the desire to over inflate the tires –which ultimately reduces the footprint, increases specific pressure on the soil and causes soil compaction. The first step is knowing the load or weight the tires will carry and the speed that will be used to carry that load. With this information farmers can adjust the inflation pressure to gain the highest tire efficiency. It’s important for farmers capture the exact weight their equipment –which can vary significantly from published weights in product literature –to ensure that tire pressure matches the proper inflation needed for each specific condition. What are the goals? The largest footprint for the lowest compaction, with the lowest slippage (due to more lugs being on the ground). Balancing floatation and grip are key. While this sounds easy, with constant changes to the loads and speed of farm equipment, it isn’t. This is where variable inflation systems come into play and will become the future standard. Many equipment manufacturers are collaborating with tire manufactures on Central Tire Inflation Systems (CTIS). One example is Fendt and Mitas creating the Vario Plus – Aircell System (winner of the Gold Medal for Innovation at Agritechnica 2017 in Hannover, Germany). This system allows for a quick adjustment in inflation pressure when changing between field and road operation. Traditionally farmers have skipped the time-consuming task of increasing inflation pressure on each tire when leaving the field and kept tires inflated to maximum pressure –a gain in convenience, but a sacrifice in efficiency in the field. The next evolutionary step is a constant monitoring and changing air pressure system adapting to load and speed changes in real time and inflating or deflating tires as needed. Imagine a combine with the grain bin filling, unloading and changing speed depending on the local yield. In this direction Trelleborg presented the VIP System (awarded the Gold Medal for Innovation at the 2017 SIMA Show in Paris, France). This self-contained system continually monitors load changes and adjusts tire inflation pressure by using its own compressor (mounted on the tire hub) to maintain the correct pressure, largest footprint, lowest soil compaction and best traction possible. This system reduces fuel consumption, slippage and working time, while saving the farmer from checking air pressure constantly and allowing for better crop conditions and yield. As equipment evolves in more automatized and efficient way, a variable inflation system for the tires is part of that evolution. Farmers will benefit with increased equipment efficiency, performance and crop yield, along with the reduced stress and workload that come from an automatic system. As an additional benefit, using the tires under the conditions for which they were designed will help them suffer less stress and last longer as they will be used at their peak performance capacity.